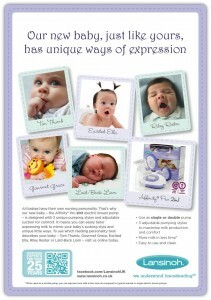 The Market Family has been appointed by Lansinoh to help launch a new range of baby nursing products. The Manchester-based agency has been working on a campaign for a new style of electric breast pump, which, it says, changes settings according to how individual babies feed. “We were approached by Lansinoh because they were looking for a highly creative solution that would help them to stand out and they knew that we could deliver. We have created two ads which help educate the market in a creative way, building awareness of the versatility and benefits of the Lansinoh electric pump,” explained Rachael Taylor, head of The Market Family. The campaign features 5 different babies, representing different feeding styles (Tim Thumb, Excited Ella, Riley Rester, Gourmet Grace and Laid-back Liam) and they will be the centre of a press and digital campaign, which will run later this year across specialist mother and baby titles. “We are a cult brand loved by breastfeeding mums and also recommended by many health professionals, so we had to ensure that this campaign struck a chord with both audiences. We have been delighted with The Market Family’s insight-led creative solution, which is an entirely new approach to the category,” added Colin Marafko, marketing director at Lansinoh.